Peaness headline the Scared To Dance and For The Rabbits gig night on Friday 30th November at The Victoria. Entry is free and support comes from Flirting. 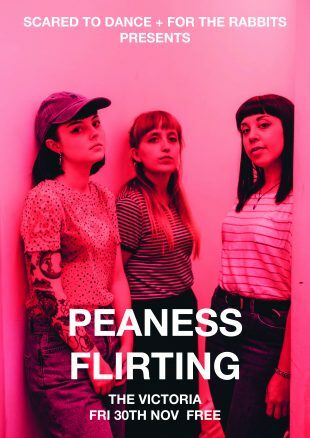 Formed in Chester back in 2014, Peaness are Jess, Balla and Rach, an indiepop trio with tunes as much fun as hearing radio presenters audibly blush when saying their name on the airwaves. The band won plenty of fans with their early self-released material, which saw them team up with Odd Box Records for a sold-out single in 2017, before settling at their current home of Alcopop! Records and releasing their debut EP, Are You Sure? Since that harmony-drenched blast of musical brilliance, the band have combined work on their debut album, with a relentless string of live dates, supporting the likes of We Are Scientists, The Cribs and The Spook School. With new material on the way soon, the unstoppable rise of Pea-Pop looks sure to continue unabated, catch them at a reasonably sized venue while you still can. Self-styled anxiety-pop quintet flirting. formed in East London back in 2016. They initially bonded over an eclectic array of music, noise and Vine videos, but ended up as what they describe as, “a group therapy project, set to a Sofia Coppola soundtrack”. The band recently released their debut 5-track EP, This Would Be Funny If It Were Happening to Anyone But Me, a fascinating collage of musical ideas; flittering from Life Without Buildings-like post-punk, to spoken word musings and angst-driven noise. Unnerving, beautiful, brutal, bruising and utterly unique, flirting. defy convention, refuse your pigeon-holes and make one of the most exciting emotive rackets you’ll ever come across.